The iPhone X's camera system is the best Apple has ever made. Here's what you need to know about it. Apple's latest flagship iPhone, the iPhone X reinvents quite a few stock iPhone features, but its new camera system is one of its best. Packed full of sensors, it includes the front-facing TrueDepth camera, a new f/2.4 telephoto 52mm-equivalent lens, f/1.8 wide-angle lens, True Tone Flash with Slow Sync, a reinvented ISP, and Portrait Lighting features. Here's everything you need to know about its camera system (and why you're going to love it). How does the TrueDepth camera system work? What are the rear camera improvements to the iPhone X? The iPhone X's front-facing TrueDepth camera replaces the FaceTime camera of iPhones past: It's primarily used to authenticate Face ID, but Apple has also built it to serve as an excellent front-facing camera system. Selfies and Portraits and Lighting, oh my! The TrueDepth camera includes an infrared camera, flood illuminator, proximity sensor, ambient light sensor, speaker, microphone, 7-megapixel traditional camera, and dot projector (which throws up to 30,000 points on your face during a scan). When you use the camera system for a selfie, Face ID scan, or otherwise, that data is scanned and processed locally on Apple's A11 Bionic chip with Neural Engine — and, if using a camera app, the image signal processor (ISP). None of that data ever goes up to iCloud or any other online server; it's kept solely on your iPhone. All of these sensors, cameras, software, and chips also make for an amazing front-facing camera: Like the rear camera system, it shoots in wide color; it also has automatic digital image stabilization. But the best part is exclusive to the TrueDepth system: The iPhone X can shoot selfies with Portrait mode and Portrait Lighting. On its own, the iPhone X's 7-megapixel front-facing camera is a pretty nice front-facing kit. But add in the other components of the TrueDepth system, and it goes from being "pretty nice" to "fantastic." Selfies abound with the iPhone X. When you snap a photo with the front-facing camera, the iPhone X uses the TrueDepth's system to create a depth map of your face and the surroundings; the various sensors provide a superior scan to the dual-camera measurements done by the rear camera, allowing for crisp and quick selfies with great focus and depth of field. I did get a chance to try the new Portrait Mode selfies, which are also enabled by the True Depth Camera. They're exactly what you'd expect: Your portrait with a computationally rendered blur and Bokeh effect applied to it. And since iOS 11 brings a depth API, it's non-destructive. 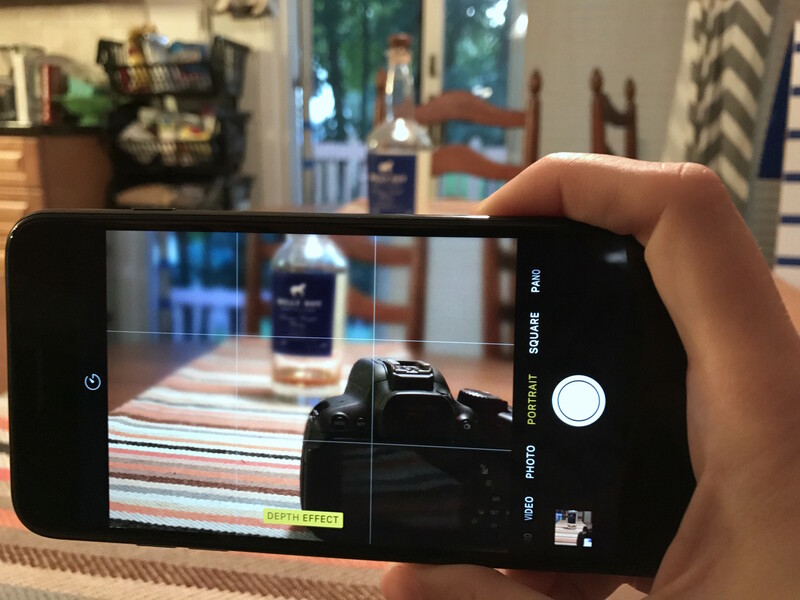 So, you can turn Portrait Mode on or off on any photo you took with it, at any time. You can even use the "depthy" data for other effects, including Portrait Lightning. Portrait Lighting is a nice addition to the front-facing camera, but where I suspect it will get the most use is in Stage Light Mono: The black-and-white spotlight mode seems custom-made for epic selfie shoots. That TrueDepth system uses a variety of sensors to grab a depth map of your face, collecting data in three dimensions. While third-party apps won't gain access to the full depth map available to Face ID (for obvious privacy reasons), programs can get general depth information from the camera, allowing them to create more detailed filters and backgrounds. The author, testing Snapchat filters at the iPhone X announcement. Snapchat, for instance, has developed mask filters for various selfies: They sit on top of your face in real-time, moving when you move and changing when you change your facial expression (whether that's raising your eyebrows or opening your mouth). Panda Snaps all the live-long day! Clips, too, offers Portrait selfie backgrounds called Scenes; with them, you can place yourself in a hand-drawn metropolis or in a Star Wars spacescape. In any other year, the TrueDepth camera would be improvement enough for a new smartphone. But Apple has also dramatically improved the rear-facing camera system for the iPhone X. Food shots look extra delish. Apple is also applying machine learning to its camera system so, for example, it continuously analyzes video in a million discreet sections to identify things like grass, sky, and motion, and then optimize compression to make sure artifacts don't destroy textures or edges. This results in sharper images, faster capture speeds, and special features like Slow Sync Flash (more on that in a moment). And best of all, they apply across the board to both photography and video capture. The iPhone X gains the same videographic improvements as the iPhone 8 series, including shooting 4K video at 24, 30, and 60 frames per second, the HEVC/H.265 compression option that saves space while capturing, and the super slow-motion 240FPS at 1080P option. Editing video shot on iPhone X with iMovie. Thanks to the ISP, you can also capture video longer without worrying about the phone overheating. I shot over 70 minutes of 240FPS footage over a three hour period with the iPhone X not so much as getting warm, let alone flashing a temperature warning. The iPhone X's rear camera comes with a quad-LED True Tone Flash: It evens out your photo so that your subject isn't washed out. In addition, Apple has packed in a new software feature — Slow Sync Flash — that combines the True Tone flash with your iPhone's image signal processor (ISP) to slow down the shutter speed while firing the flash. Portrait mode greatly benefits from Slow Sync Flash. Why is this important? If you're shooting in low light, three things are important to expose your image properly: A large aperture (the size of the opening that hits your camera's sensor), ISO (your iPhone's light sensitivity), and a slower shutter. A slow shutter lets more light into your camera when you press the capture button, thereby making your image brighter. In older iPhones, when you turned on the Flash setting, your iPhone would match the shutter speed with the brightness of the flash; as a result, the subject in front of the flash would be evenly exposed, but anything not covered by the flash would be overly dark. Two Slow Sync Flash photos, taken in Portrait mode with the rear camera. Slow Sync changes that by having the flash fire in intervals, letting the ISP expose the subject and background differently: The result is a photo with more detailed backgrounds, even at night. Slow Sync Flash can also be used to express movement in flash photography: Have you ever seen an image with the subject in focus while trailing lights fill the background? That's one side-effect of Slow Sync in professional cameras. Digital Photography School has some great examples of this technique, if you're curious. A repeating gif of Slow Sync Flash in action on the iPhone X. The iPhone X is the first smartphone that can be rightly called a "smart camera": It's smarter about taking photographs, framing shots, depth mapping, slow-motion video, and saving images without stealing your storage space. It's already become our favorite camera to shoot with here at iMore HQ, but what about you, folks? What do you think about the iPhone X's camera and Slow Sync flash? Let us know in the comments. Updated November 2017: Rewritten to include more information on the TrueDepth camera, Slow Sync flash, and new photos.